This is already my third summer boho-inspired crochet baby pattern. 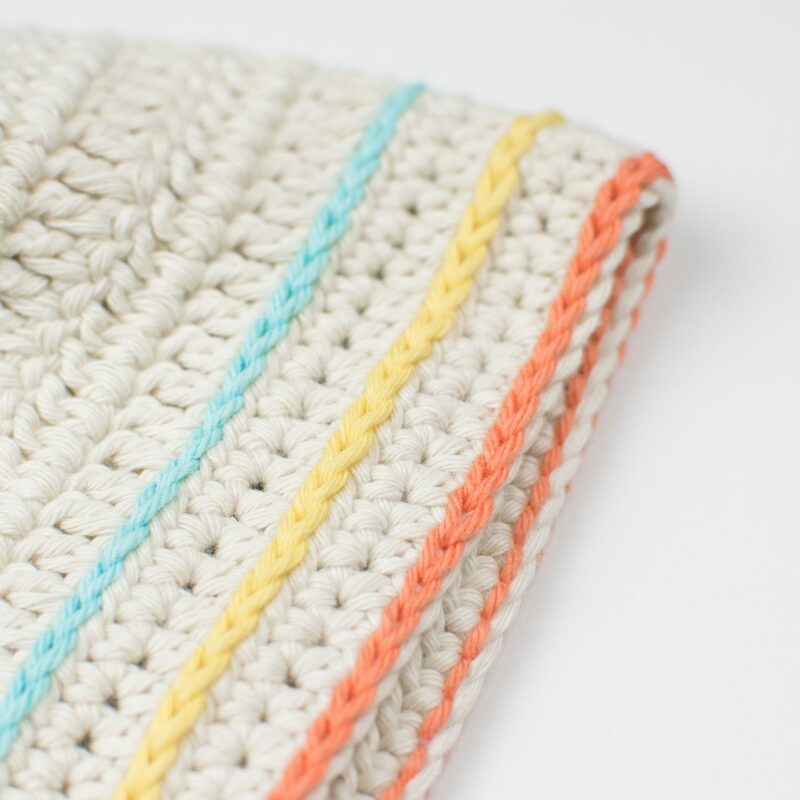 All of them are made with off-white Rico Creative Cotton Aran yarn and have three lines of slip stitches made with Paintbox Cotton DK yarn in shades Washed Teal, Daffodil Yellow and Bright Peach. I love when yarn has clever names. It makes them even more irresistible. 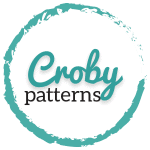 And if you haven’t tried the rest of the patterns in my baby boho collection, you definitely should. They are super cute. 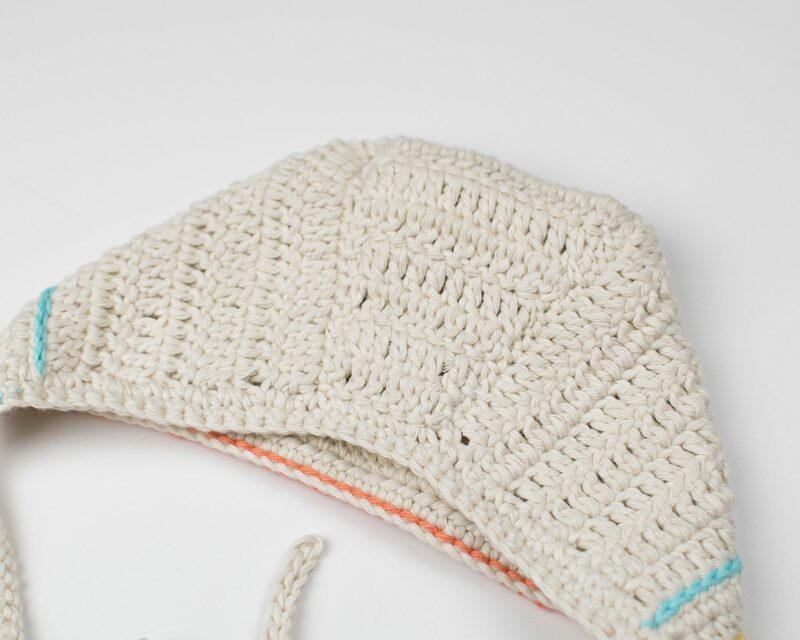 The baby bonnet is made is a few simple steps. The main part is one “large” panel in a shape of a letter T. The top of the letter is a part that goes over the head and the part that runs perpendicularly is the back of the bonnet. Those two parts are later joined together with a tapestry needle and yarn ends creating a basic shape of the hat. I’ve added three lines of slip stitches to make the bonnet more playful and fun. And in the end, I’ve created two straps that you can tie in a beautiful bow. 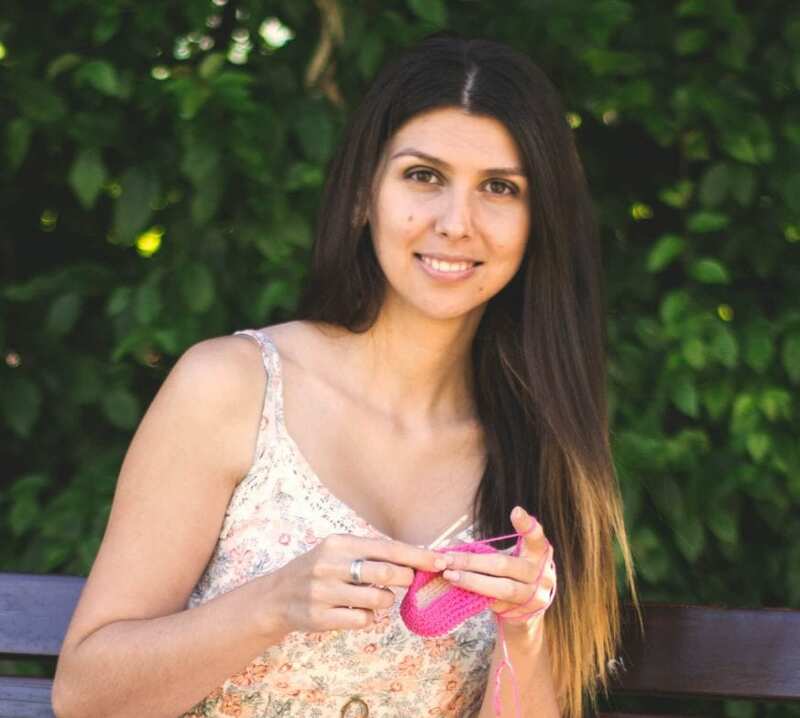 Watch the video and follow the step by step tutorial to learn how to make this crochet baby bonnet from start to finish. Please consider subscribing to my YouTube channel (HERE!) and turn on post notification so you will not miss any of my future videos. YARN: For this crochet baby bonnet I was using an Aran weight yarn and DK weight yarn. Rico Creative Cotton Aran 100% cotton yarn in color nature (60) for the bonnet and Paintbox Yarns Cotton DK in colors Washed Teal (433), Daffodil Yellow (422) and Bright Peach (412) for the three little lines of slip stitches. GAUGE: 9 sts and 4 1/2 rows in DC using 4.0 mm crochet hook and Aran weight yarn measure 5 x 5 cm (2 x 2 inches). 0 – 6 months – 30 cm (12”) across and 15 cm (6”) high. 6 – 12 months – 37 cm (14 1/2”) across and 16 cm (6 1/4”) high. 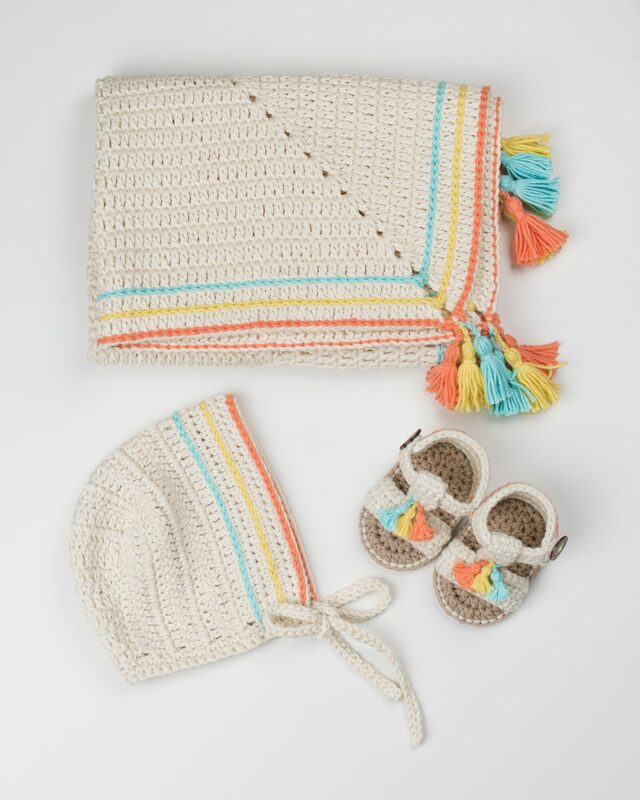 1.Crochet Baby Blanket – Classic Granny Square Baby Blanket | 2.Crochet Baby Sandals – Boho Girl | 3.Crochet Baby Top – Little Lace Tank. 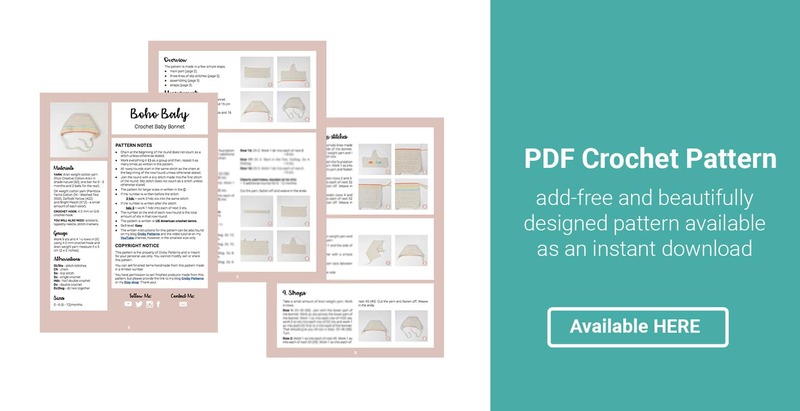 The instructions are written in a few simple steps: main part, three lines of slip stitches, assembling and straps. Take Aran weight yarn and create a foundation chain made of 52 chains. Create 1 additional chains that will represent our turning chain. Start in the 2nd chain from the hook. Work in rows. Turn after each row. Row 1: Work 1 HDC into each of next 52. = 52 sts. Row 2 – 4: Ch 1. Turn. Start in the first. Work 1 HDC into each of next 52. = 52 sts. Row 5 – 11: Ch 2. Turn. Work 1 DC into each of next 52. = 52 sts. Mark 14 sts; right in the center of row 11. Row 12: Ch 2. Start in the first. Dc2tog. Dc 12. Dc2tog. = 14 sts. Row 13: Ch 2. Start in the first. Dc2tog. Dc 10. Dc2tog. = 12 sts. Row 14: Ch 2. Start in the first. Dc2tog. Dc 8. Dc2tog. = 10 sts. Row 15: Ch 2. Start in the first. Dc2tog. Dc 6. Dc2tog. = 8 sts. Row 16: Ch 2. Work 1 dc into each of next 8. = 8 sts. Row 17: Ch 2. Start in the first. Dc2tog. Dc 4. Dc2tog. = 6 sts. Row 18: Ch 2. Work 1 dc into each of next 6. = 6 sts. Now we are going to create 3 simple lines made of slip stitches on the front side of the bonnet. This part will be made with DK weight yarn and I will use a different color for each row. Row 1: This row is made between the foundation chain and row 1. Use orange yarn. Work 1 ss into each of next 52 sts. Cut the yarn and fasten off. Weave in the ends. Row 2: This row is made between rows 2 and 3. Use yellow yarn. Work 1 ss into each of next 52 sts. Cut the yarn and fasten off. Weave in the ends. Row 3: This row is made between rows 4 and 5. Use blue yarn. Work 1 ss into each of next 52 sts. Cut the yarn and fasten off. Weave in the ends. 1. Take a small amount of Aran weight yarn and the tapestry needle. Tread the yarn. 2. Line up the bottom of row 11 and the side of the rows 12 – 18. 3. Sew those two part together with a few simple sewing stitches. 4. Cut the yarn and hide the yarn tails between the stitches. 5. Repeat the steps on the other side. Take a small amount of Aran weight yarn. Work in rows. Row 1: Ch 45 (49). Join with the lower part of the bonnet. Work sc sts across the lower part of the bonnet. Work 1 sc into each row of HDC sts, work 2 sc sts into each row of DC sts and work 6 sc into in the back of the bonnet. That should give you 44 (50) sts in total. Ch 46 (50). Turn. Row 2: Work 1 ss into each of next 45. Work 1 sc into each of next 45. Work 1 ss into each of next 45. Cut the yarn and fasten off. Weave in the ends. 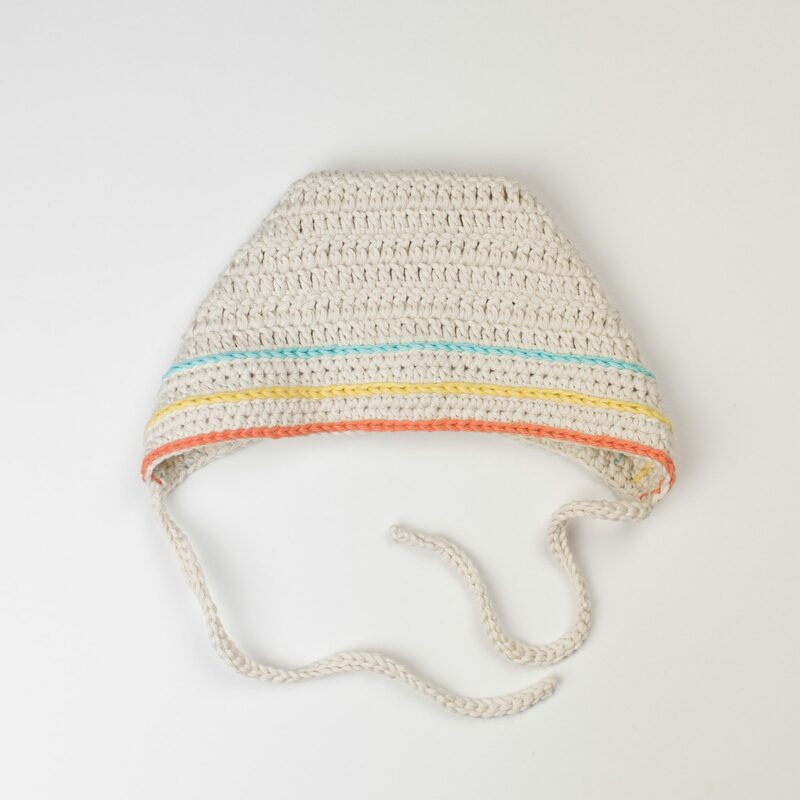 And your adorable baby bonnet is now complete.